Elk River, mansions and mcmansions, Mississippi River Trail, Otsego Park, suburbs without sidewalks were planned by car culture creeps, The Dashwoods, What in the World is a Christian haircut? After biking and gardening and chickening and choring and erranding it became clear yesterday that I had run out of time to do the usual Sunday posting so the weekend gets to spill over into the week which is ok since I don’t have anything particularly bookish today. Let’s begin with the silly chickens. Elinor, she is the Rhode Island Red, is a delightfully chatty bird. She has these feather puffs on the side of her head where one would expect to see ears if she were a mammal and it makes her look like she is wearing tiny chicken earmuffs. She likes to get up close to my face and “talk” to me in the most earnest way. She always has quite a lot to say and will keep going in “conversation” with me for some time before she either runs out of things to tell me or she gets distracted. But if she gets distracted and I address her directly she will come over and start talking to me again. Because of the earmuffs and the earnestness of her manner she cracks me up every time and I suspect that part of our conversation is actually her scolding me for not taking things more seriously. Elinor is also the only one who doesn’t mind being touched and I think she might enjoy it when I stroke her chest or caress her side. She doesn’t stand still and ask to be petted, she just doesn’t mind the passing attention. Her feathers are silky soft and smooth. The Dashwoods are four and half months old and while still not old enough to begin laying, we thought it time to put the nesting boxes in the coop so they can get used to them being there. The boxes are plastic bins the size of a small cat litter box. They have bedding in them so they are nest-y. Chickens also like to feel safe in their nest so the boxes are in a little open plan bedroom so to speak. The “room” is three sided with two side walls and a back wall that is actually the egg door that we can open from outside the coop and reach in and get the eggs. The bedroom has a low, sloping ceiling high enough so they aren’t squished in there but not roomy enough for standing around and hanging out while not laying an egg. The ceiling slopes at an angle down toward the opening into the nests. The slope is to discourage them from sitting on top of it and pooing all over it. They did really well not freaking out over this new feature in the coop. Unfortunately they haven’t learned to roost yet and the nesting boxes are over near the corner of the coop where they all like to sleep piled together like a litter of puppies. When Bookman went out to close the coop door for the night their favorite corner for bedding down was considerably smaller. Instead of choosing a different corner they crammed themselves into the tiny space left by the nesting boxes. Even chickens have favorite places to sleep and give them up reluctantly. They did get to spend time out of the run on Sunday digging around in leaves and woodchips and dirt. We’ve got a couple garden beds in the chicken garden in which we planted cowpeas to help build soil fertility since it is nothing but sand at the moment (the leaves and woodchips are helping too as are the Dashwoods). We cover up the plants when the chickens are out otherwise there would be nothing left of them. Bookman and I have been consulting on what we want to do with the area, do we want to make raised beds and grow vegetables or do we want to a pollinator/butterfly garden and leave it open for the chickens to root around? We have elderberry, serviceberry, quince, and a rose bush along the chain link fence that will grow and form a kind of hedge eventually. We are going to transplant some raspberries in the spring and see how they do. Then the rest of the area will be given to grasses and flowers. It seems the best thing to do so we don’t have to constantly worry about the Dashwoods eating things we don’t want them to. So this winter I will get to have some fun figuring out what might grow in sand. I haven’t found a place purple coneflowers refuse to grow yet so I will sprinkle some seeds this fall from plants already growing in my garden and see if they germinate. And then, well, we’ll see! The scarlet runner beans we have growing up the shed in the chicken garden are doing well all things considered – growing in sand and sometimes getting pecked at by the Dashwoods – little red flowers are starting to appear. They aren’t showy, but their color is so bright and surprising that is what makes them so interesting. Besides the chicken garden I have cowpeas planted in the polyculture bed. They are the only thing that has done well in this bed this year. I planted them all around the garden last year and they did well but they were tucked in here and there. With their own space they have turned into lush bushy monsters with beautiful huge dark green leaves. They are starting to flower and in a few weeks I’ll see bean pods sticking out all over. The Tom Thumb bush peas I planted in the polyculture bed two weeks ago are up and I think the fava beans are starting to poke up too. I am pleased with that since it appears none of the carrot, radish or winter lettuce mix I sprinkled in the bed is going to bother sprouting. But given that none of the other lettuce, radish, beet or carrot seeds I have tried in this bed all summer have sprouted I should not be surprised. We’ve gotten several zucchini and Bookman is planning jars of relish and pickles. We have a few tiny green pumpkins that are giving us hope for future pie. The cantaloupe plants are flowering and looking great but I have yet to spy a melon which makes me nervous because while there are still plenty of warm days left, they are getting shorter and nights will be getting cooler. Melon needs long warm days. I think we may have planted it a week or two too late this year. But time will tell. They may surprise me yet! I went on my planned long bike ride Saturday. 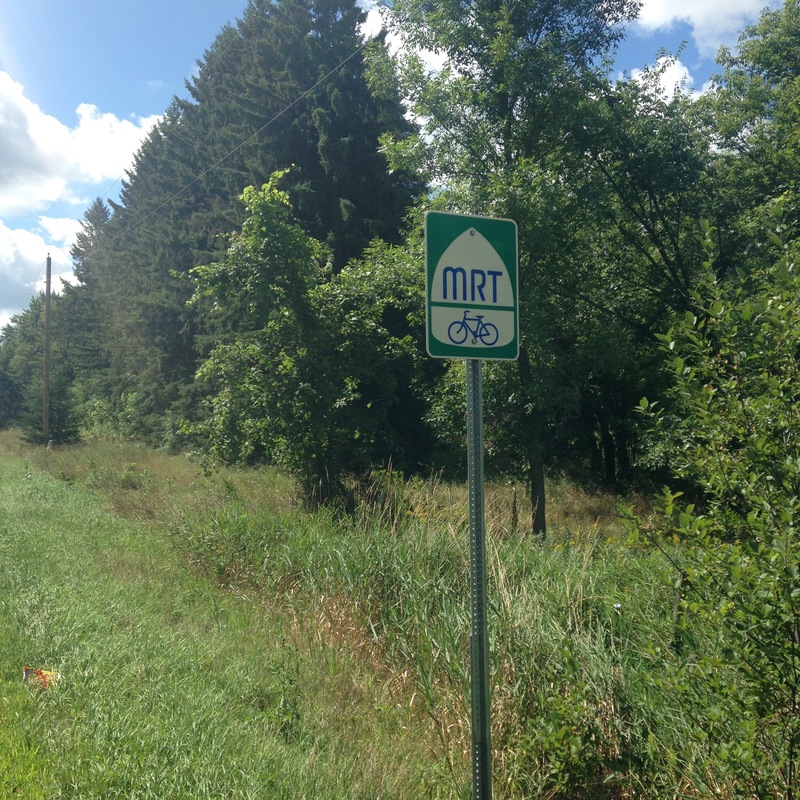 I rode 98 miles/158 km north along the Mississippi River to Otsego Park in Elk River. Like my trip south along the Mississippi, this one took me to the confluence of the Mississippi and Elk Rivers. 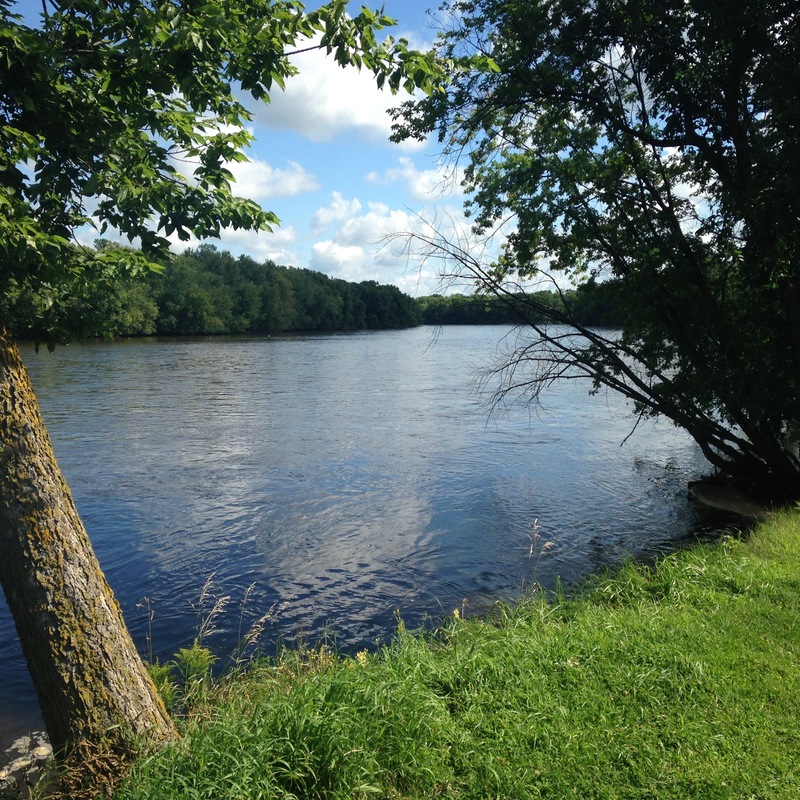 We’ve been getting lots of rain this summer and both rivers were high and flowing fast. They are wide and deep and, like the Mississippi and St Croix, just kind of blob together without fuss. The weather was fine but the route itself was uninspiring. Unlike south and all the farms, north turned out to be industrial and mostly suburban filled with McMansions and one actual honest to goodness mansion. The place was huge! Gated with an artificial lake you could row a boat on, a tennis court and a swimming pool, along with acres of lawn cut in the crosshatch pattern like on baseball outfields. It was an astonishing sight to see. I saw many muskrat behinds as they all went running away. In the early part of the morning they must have been out foraging and they saw me before I saw them and turned and ran back toward the river and home so that all I saw of them were their jiggly round red-brown butts as they ran away. As far as animal backsides go, they are some of the more entertaining ones I suppose. Other than that I mostly had to entertain myself with signs. There was the sign in front of a hole-in-the-wall diner that said “Rare Pokemon Found Here.” Then there was the sign for “Christian Haircuts” with a phone number to call presumably to make an appointment. This gave me many minutes of distraction wondering what, exactly, is a Christian haircut. I still have no idea. My other sign entertainment was the street name signs. I noticed a street called “Unicorn” and was giggling about that when the next street was called “Tiger” and then “Rabbit.” So I said, ok, let’s play this game! “Quail” I decided would be next but there was a long stretch before the next street and it was “Puma”! Confound it! The next one is going to be “Otter”! Another long stretch and “Iguana” street goes by. Where are all the other streets? They must not have gone through to the road I was on which was disappointing and foiled my game. The streets concluded with Gibbon, Chameleon and Bison before beginning at “Z” with elements! Past all the elements I went to find myself at “Z” again with the names of Native American tribes (Zuni, Yakima, Waco) and then I got grumpy about how something like that could only happen in white suburbs and street names ceased to be entertaining. Then it was just a long, boring blur until I got back into the city and had to avoid riding through a wedding party’s photographs by the river (that would have been an awesome photobomb though!). I also had to avoid the tired runners of Ragnar who were apparently so tired they could not read the signs indicating which was the people path and which the bike path. But the runners were easy to maneuver around in comparison to the Twin Cities Polish Festival I found myself in the middle of. The street was narrow and cobbled and the cobbles were not in very good condition. It is just as well they forced me to go slowly, creeping along behind cars that were also trying to get down the street, because festival pedestrians enjoying beer and food and loud music on a warm Saturday afternoon do not look when they step out into a street that wasn’t even closed to traffic. By the time I got home I was exhausted, not physically but mentally. I will not be taking that route again, it had nothing going for it. Astrid did, however, get some major TLC Sunday afternoon. I took her out onto my deck and spent about two hours cleaning the nooks and crannies of her nooks and crannies. She hasn’t been this clean and shiny since I brought her home brand new from the bike shop. Our adventures are beginning to show. I found a few chips in her paint, from gravel racing most likely. And while all of her component pieces are still sturdy and sound, I could see on the cassette where the chain is wearing on the metal cogs of the various gears. While I still have dirt and grease under my nails that I couldn’t get clean, Astrid is lubed up and pedaling and shifting as quietly and smoothly as she has in a long time. With all the gunk gone she makes a happy whirring sound, ready for our next adventure. Elinor sounds like an Eleanor Roosevelt of the chicken world. She might be warning you not to vote Trump in November! I enjoyed your account of your bike ride. All those fascinating signs and the reassurance that Pokémon Go is everywhere…. Ian, heh except I think my Elinor isn’t quite as diplomatic! Glad you enjoyed my biking account. The Pokemon sign made me laugh. I wonder if it get more people to go inside? I was thinking about you last night while watching one of the home renovation shows I’m addicted to. A young couple was renovating a house in Austin, TX, but all the husband could think about was building a chicken coop and having chickens. The wife was afraid of chickens! But he built his coop out of reno discards and finally got his three chickens. He was more excited about that than about the house. Joan, oh that’s funny! Afraid of chickens? I suppose when mine are in piranha mode things can get a bit frenzied and my knees find themselves in peril but I would never think to be afraid of them. Hopefully with experience she loses her fear. Discards for coop building is the way to go if you can get the supplies, so much cheaper. Jenclair, I never imagined they would be so amusing! Heh, the signs and streets did offer some measure of compensation. At least I know where not to go in the future! The one thing you’ve definitely inspired me to do is plant some more coneflowers! They’re so hardy and lovely and good for pollinators. Thanks! I hope your next riding adventure will be more interesting – I’m sure it will be! Ha, I never knew chicken earmuffs were a thing! Of course I had to google that once I read the phrase, and there are a couple of websites debating chicken beard/sideburns vs chicken earmuffs. So jealous of your rain (and your lovely-sounding garden). It’s been so dry here that they’ve advised not starting any new planting, so we’re just trying to keep our marigolds and one tiny rosebush alive. Carolyn, we have had so much rain this summer that there was only a few times in early spring and when it was super hot that I have had to water. It’s been kind of crazy and there has been some localized flooding. I have been lucky in my area though and the garden has loved all the water. Rare Pokemon Found Here and Christian Haircut….I do wish I could bike ride in your neighbourhood! LOL! cirtnecce, heh, you never know what you might find! I do love a good sign – so loved hearing about your entertaining yourself with signs. I’d probably like serviceberries too since I’ve rarely met a berry I didn’t like, but I’ve never heard of them. I’m continually amazed by how many berries there are – and how, at my getting to be ripe old age, there are still ones I haven’t heard of! As for Astrid’s chips, I could wag my Royal Society for the Prevention of Cruelty to Biles finger at you, but then I realised that Astrid is getting older and I suppose she can have a few chips just like I have the odd wrinkle, so I’ll let you off this time. I was going to ask when you expect eggs, and then ask what do vegans do with eggs? Or, are you not 100% vegans. You’ve probably told me before and I’ve forgotten! If I have, I apologise and refer you to my references to age in the above two paras! whisperinggums, it is a pretty sad ride though when I have to entertain myself with signs! And thanks for not reporting me to the Society. I think in all our adventures, Astrid has gotten off lighter in the injuries than I have! I have not had serviceberries before either. They are supposed to be pretty tasty. I hope to find out sometime but the little shrub is growing so slowly it might be a few years! I love berries and am always up for trying “new” ones!